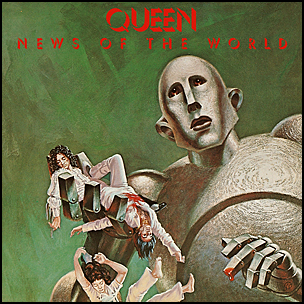 On October 28, 1977, “EMI” label released “News of the World”, the sixth Queen studio album. It was recorded July – September 1977, at “Sarm West” and “Wessex Studios” in London, and was produced by Freddie Mercury, Brian May, Roger Taylor, John Deacon, and co-produced by Mike Stone. The album featured tracks “We Will Rock You”, “We Are the Champions” and “Spread Your Wings”, and sold in more than 10 million copies worldwide. The album’s cover was a painting by American sci-fi artist Frank Kelly Freas.